Welcome to Veracruz Penthouse 2501 in exclusive Cape Marco. This amazing penthouse unit is a one of a kind floorplan. 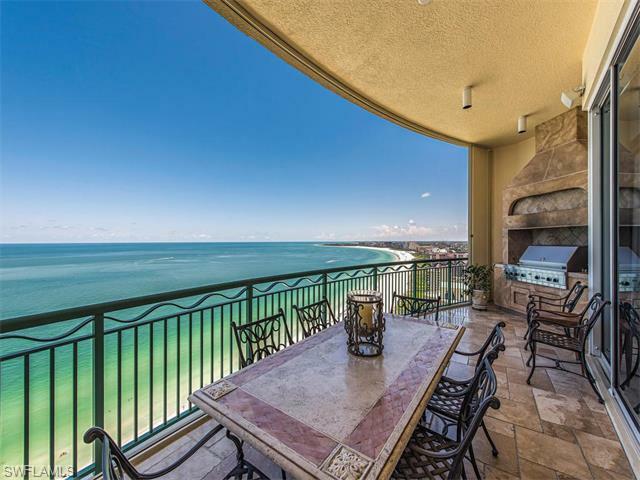 From the expansive beach views which are visible in almost every room of the unit to the impeccable attention to detail throughout this unit is truly remarkable. Enter into this magnificent unit from your private, security coded, elevator into the foyer boasting designer inlaid flooring and decorator coffered ceiling. The kitchen features Halogen under cabinet and pinpoint ceiling lighting with Sub-Zero refrigerator and 110 bottle wine cooler, Dacor Double ovens, warming drawer, microwave and cooktop, built in hood with detailed cabinetry, center island with vegetable sink, bar seating and built in desk which open to the family area with those incredible beach views. The formal living area features a beautiful marble fireplace and full bar with seating and 20 foot round coffered ceiling with multiple skylight windows. The formal dining room sits over the beach with floor to ceiling windows and lighted tray ceiling. This residence also boasts a private theatre and office/den both with exquisite wood paneling and built ins.